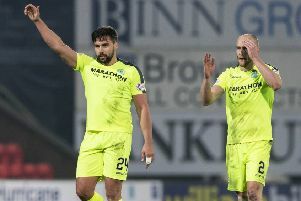 Hibs boss Neil Lennon bemoaned his side’s failure to take their chances after watching them surrender a two goal lead to the Premiership’s basement side Dundee. The Easter Road side haven't won in five games now but looked to be heading for all three points when an own goal from the visitors' Genseric Kusunga and defender Ryan Porteous' header had the hosts two up inside the opening half hour. However, Kenny Miller reduced the deficit on the stroke of half-time before Paul McGowan levelled the game two minutes into the second half. And Lennon was disappointed his side were unable to extend their lead further. He said: “It’s symptomatic of the spell we are going through at the moment, we are not putting teams away. “We conceded two poor goals by switching off. Some of my senior players are not playing at the level they could be and my strikers are not functioning. “The positives is that we have broken that run of not scoring goals and we have moved up a place - but it feels like two points lost. You have to give Dundee credit, they made us change our shape ten minutes into the second half. We were abject, feeling sorry for ourselves, lacking character.